« Harvest These Fall Savings and Save Money on Your Holiday Shopping! These Deals Expire 11/30! I love the holidays, for it's the season for donning our gay apparel and decking the halls with boughs of holly. It's also the season for making our lists and checking them twice...shopping lists, that is! During this season, when my to-do list is long and my time seems to be running short, I greatly appreciate any store that can help me spruce up my home as well as cross several items off of my gift giving list. 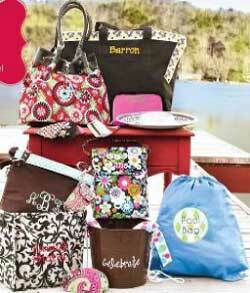 Initials, Inc. is a national direct selling company that offers personalized handbags, totes and items for the home. All items are customer designed and personalization is completely FREE! Their home party company is defying the odds and growing at an incredible rate, doubling in size since 2010. However, Initials, Inc. is not celebrating alone, but rather with the thousands of consultants nationwide who are reaping the rewards of a profitable and fun business. Melynda LeMaire is one of these creative partners who was generous enough to sponsor a product review and giveaway for the readers of Mommy Living the Life of Riley! Keep reading to learn more! I reviewed the Sort It All Out Personalized Tote in the Vinings Pattern from Initials, Inc. Creative Partner Melynda LeMaire, which retails for $55.99. The Georgia based Initials, Inc. is a premier personalized handbag and accessories company in the Direct Selling Industry and is consistently experiencing phenomenal growth in both sales and recruiting. The core company message of "There's only one you!" is celebrated through amazing personalized products, being top in category career path and an abundance of opportunity for all that seek more for themselves and their families! Melynda LeMaire is just one of the thousands of independent creative partners forging a successful career with Initials, Inc. She is a stay at home mom of two beautiful children and wife to a wonderful husband. She enjoyed being home with her kids, but wanted to earn some extra money at the same time. Initials, Inc. was featured in Woman's Day magazine (October 17th issue) as one of the best direct sales companies and she was lucky enough to become a part of it at just the right time. Melynda would love to help you have this same wonderful opportunity that has made such a wonderful difference in her life, so if you are interested in more information, please contact her to answer any questions and help you get started. I had the chance to review one of Initials, Inc.'s gorgeously designed, personalized items and after browsing through their vast catalog, I just knew I had to try the Sort It All Out basket. 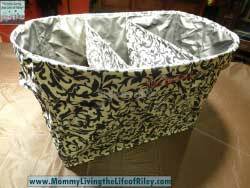 This basket comes in a variety of colors, as well as the Vinings pattern, which is what I selected. I loved this basket for it was so large (30"w x 18"h x 20"d) and could serve a variety of purposes in almost every room of my house. What's great about this tote is that it has three separate compartments so that you can organize your belongings within the tote itself. 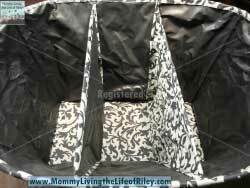 The Sort It All Out basket also folds completely flat for storage and has two sturdy handles on the sides so that you can quickly pick it up and tote it anywhere. Remove the metal rods and the Sort It All Out folds completely flat! 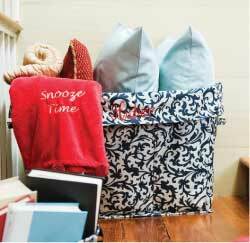 Personally, I am using the Vinings Sort It All Out tote to store all of the decorative pillows and throws that go on our bed, when we make it up completely. 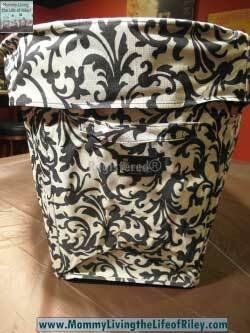 Our bedroom is decorated in this same black and white damask pattern and so the Sort It All Out tote matches perfectly and looks great with these additional pillows stored in it. I hate to admit it, but I don't make our bed completely (with every decorative pillow and such) every day, but generally just for when company comes over. Now, our bedroom still looks great for my pillows and throws are tucked away neatly inside this personalized tote when not in use. When company comes and my bed is fully made, I plan on using this tote in our guest bedroom where I will present fresh towels, extra blankets and other assorted goodies using the Sort It All Out tote to make our visitors feel welcome. Initials, Inc. has some of the cutest personalized handbags, totes and items for the home that I've ever seen. So if you'd like to knock out your holiday shopping and make your home look wonderful at the same time, then don't hesitate to browse Melynda LeMaire's Initials, Inc. online store. 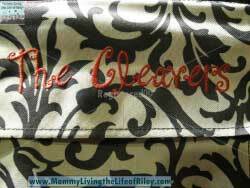 Personalization is always FREE and your items are guaranteed to look fabulous! Disclosure: I received the Sort It All Out Personalized Tote in the Vinings Pattern from Initials, Inc. Creative Partner Melynda LeMaire in order to facilitate my review. No other compensation was received. This product review is based on my own personal experiences with this item and is completely honest and objective.